Dressed up in your new outfit only to feel low about your thin lips, dark circles and scant eyebrows? Here are a few tips on how you can make them look better. • Go half way with the eye, lifting the eyeliner straight and outwards the eyebrow as opposed to going along the eye shape. Apply a light shimmer in the corner of your eye which will open up and make them look bigger. • Apply a light eye shadow on the lip and under the eyebrows to highlight your eyes and give it a better look. • Apply the concealer with your fingertips lightly patting it outwards. • Use a desired foundation all over the face including the concealed area. • Outline your lips with a lip lining pencil a tone darker than your lip colour and apply a lighter shade which is glossy. • Avoid using dark brown or black eyebrow pencil as the strokes are very hard and unnatural. 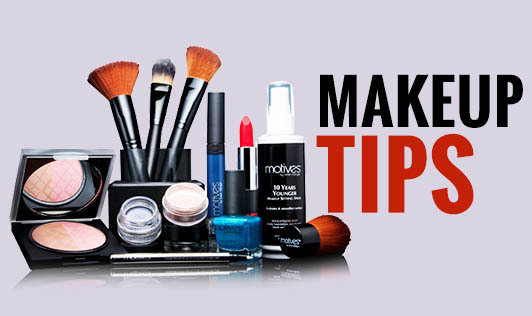 Instead, use a medium brown eye shadow with a thin brush. • Apply it lightly and paint the stroke in.